Photographs by Daniel Petz of Prague. 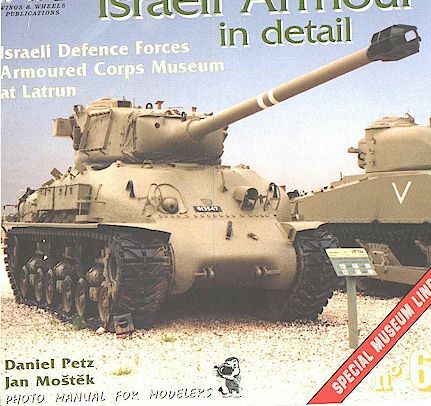 This issue, No6, is titled "Israeli Armour in Detail (Latrun Museum Israel)". The captions are printed totally in English. Price: About £ 9-50 from specialist book dealers. Printed in the usual Landscape format from this publisher and on very high gloss paper it follows the other subjects in the series on Tracks, it does slightly differ in not being about one particular vehicle but the outdoor exhibits at Latrun. The book's 38 pages are crammed full of high quality colour photographs of the main exhibits at Latrun. It contains a total of 66 photographs they are ether one or two to a page. The photographer has selected the photographs with great care and, in setting them out in a chronological way, helps with the history of the Israeli Armoured Forces. The subjects covered are too many to name individually, but some I feel certainly some have not been seen here in the west before. The captions are kept to the bare minimum and no way detract from the impact of the photographs. The main types are covered as one would expect but the surprises are in page order. Sherman Observation Tank page 7, Achilles Mk 1c page 9, Centurion BARV page 14, Marmon Harrington page 22, RBY Mk 1 Ramta page 24, T-34 SPH page 33, T-54 APC page 35, lastly the single page on Russian armoured cars page 36. More about these in the summing up. Summing up if you are into making models of Israeli Armour this book will help to point out and clarify several points about the use of a particular tank. It will also settle arguments about the placement of fittings etc. Like all good wines or a Gateau this is only a taste and it leaves you wanting more. So can I please make this plea to the publishers? Can you commission your photographer to revisit Latrun and photograph the vehicles listed above in closer detail? So that each one forms a book in its own right. I know from experience they will sell very well. I know I often say this or that book deserves a place on the reference shelf. Well I am saying it again for this book! Go out and buy one now.